Hewn out of solid rock, the extraordinary church of St. George (Bet Giorgis), Ethiopia, represents one of the wonders of the medieval world. 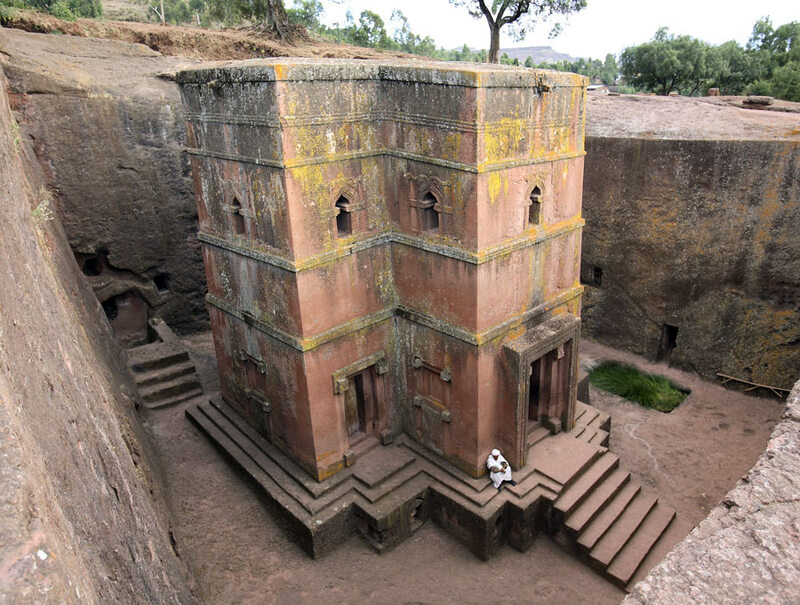 Dating from the late 12th or early 13th century AD, the construction of the church is ascribed to King Gebre Mesqel Lalibela, one of the last kings of the Zagwe dynasty. It is located near town of Lalibela, which is situated roughly 640 km north of the country’s capital, Addis Ababa. This town contains a remarkable collection of monolithic, rock-cut churches. Eleven in total, these buildings were erected in and around the year 1200 and are a testament to the skills of Ethiopia’s medieval stone masons. The church of St. George stands proud in a 25m by 25m wide pit that is carved out of solid volcanic rock. The construction of the church involved excavating a free-standing block of stone out of the bed-rock and then removing all the waste material from around it. The stone masons then carefully chiseled away the church outline, shaping both the exterior and interior of the building as they went. They fashioned a simple yet exceptionally beautiful cruciform structure approximately 12 m high. The church contains three west-facing doorways, nine ‘blind’ lower level windows and twelve upper-row windows. A number of the windows are embellished with carved semi-­palette cross motifs, while the roof of the structure contains a sequence of Greek crosses in relief, one inside the other. The church grounds are accessed via a descending trench and tunnel, which allow access to a sunken courtyard surrounding the building. This contains a small baptismal pool, while its vertical walls have a number of caves that are used as basic housing for priests and as burial tombs. 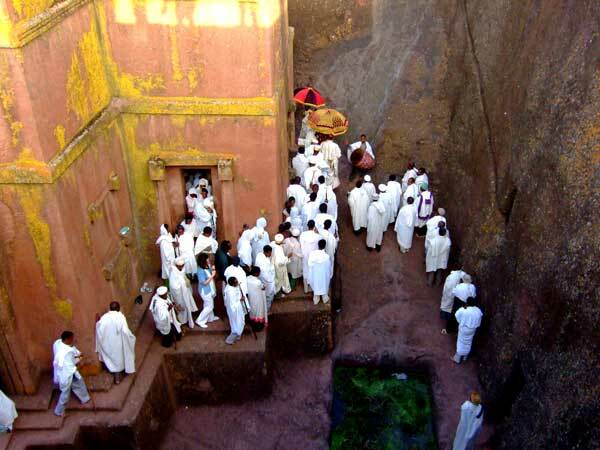 Still a place of pilgrimage for members of the Ethiopian Orthodox Tewahedo Church, Bet Giorgis (St. George’s) now forms part of the UNESCO World Heritage Site “Rock-Hewn Churches, Lalibela“. Lalibela: It was registered by UNESCO in 1978. Lalibela: A true wonder of the world not “built” but “hewn” and intricately curved from Virgin rock, are unable to believe that the rock churches are entirely made by man. 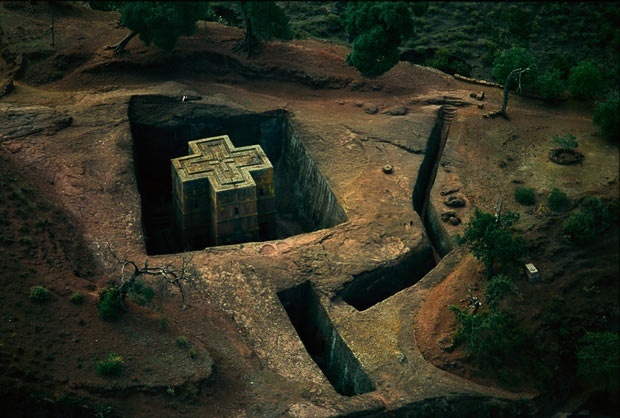 Lalibela is internationally renowned for its 11 rock-hewn churches which are sometimes called the eight wonders of the World.